The US says it will continue to push for a 34-nation free trade zone in the Americas, despite opposition from left-wing governments in the area. US Commerce Secretary Carlos Gutierrez said such a deal would be the best way to tackle poverty. He was speaking in Argentina ahead of a regional summit. 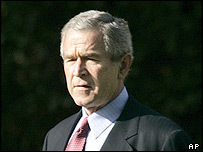 Earlier, President George W Bush said plans for the Free Trade Area of the Americas (FTAA) had stalled. Venezuela's leader said he would resist any effort by the US to revive talks. The FTAA, planned for this year, would have covered 800 million people with an annual output of $14 trillion. Mr Gutierrez's comments came as leaders of the 34 countries prepared to meet in Argentina for a two-day summit opening on Friday. Officials said Mr Bush would arrive at the Summit of the Americas in the resort town of Mar del Plata with several ideas for job creation in the region, but gave no details. The president, who was re-elected a year ago, is also due to visit Brazil and Panama after the summit. "The FTAA has stalled, I agree," Mr Bush told reporters on Tuesday in Washington, acknowledging that disagreements between the US and other major nations in the Americas had derailed the original timetable. He said the global trade talks known as the Doha round, aimed at securing a new global free trade pact by the start of 2006, now had to take precedence over the FTAA. "The Doha round really trumps the FTAA as a priority," he said, "because the Doha round not only involves our neighbourhood, it involves the whole world." Mr Bush said he hoped that Brazil, which he described as "a very important player in Doha", would put pressure on the EU to cut its farm subsidies, which have been a major sticking-point in the world trade negotiations. The idea of the FTAA, which was intended to cover the whole hemisphere except Cuba, was originally put forward at the first Summit of the Americas in Miami in December 1994. However, differences between the US and Brazil over how to proceed, the 2001-2 economic crisis in Argentina and the rise to power of FTAA opponent Hugo Chavez in Venezuela all disrupted the timetable. Mr Chavez and Cuban President Fidel Castro are promoting their own left-wing economic alliance.